The Overwatch League has revealed the full worldwide viewing figures for the Grand Final event, and they are certainly not to be sniffed at. 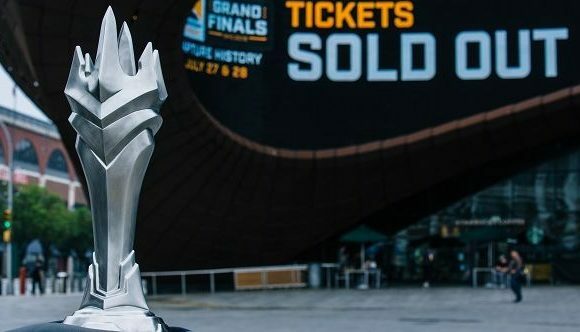 10.8 million people tuned in to see London Spitfire defeat Philadelphia Fusion, exceeding the audience for all of the 2018 season’s opening week, which had previously set the standard for OWL viewership. Only two matches (accounting for a total of seven maps) were played across the Grand Final weekend, in contrast to the significantly higher total of 12 matches (49 maps) played during the opening week. London Spitfire cut proceedings short on Day 2 of the Finals, securing a 2-0 victory over Fusion, eliminating the need for a third match. There was also a performance by DJ Khaled, which has, intentionally or not, generated a lot of memes. The global average per minute across both days 861,205, with around 650,00 of those viewers falling into that sweet, sweet 18-34 demographic. The estimated total global average minute audience across both days exceeded one million. That’s a lot of pro Genjis. The Grand Finals were held at the Barclays Center in Brooklyn, New York for a sold-out audience and broadcast worldwide via Twitch and MLG.com. In China, the matches were broadcast on ZhanQi TV, NetEase CC, and Panda TV; and broadcast to US audiences on ESPN, ESPN2, ESPN3, and Disney XD, along with a highlights show on Sunday, July 29, on ABC. The Overwatch League will return to the Blizzard Arena on August 25-26 for the All-Star Weekend, which will feature a series of custom ‘skill’ matches and the All-Star Game, which will see the best players from the Atlantic and Pacific regions face off. Last week, two new franchises joined the league, in Atlanta and Guangzhou, China, with more expected to follow. For those who like to play Overwatch rather than just watch, the Summer Games 2018 event kicks off today, introducing a slew of new skins themed around sports including Waveracer D.Va, Gridironhardt, Lacrosse Roadhog and Fastball Zenyatta. You will also be able to pick up all previous Summer Games Skins, as well as take part in the limited time game mode Lucioball.